Hi. This is my card for the Magnolia Down Under Challenge, as a design team member. The challenge this time was BEDAZZLED. You know, lots of glitz and glam. Winter is the perfect time to glitter everything up. I have made a Diorama card. There are three layers you can decorate. This was my first attempt and it was so much fun. 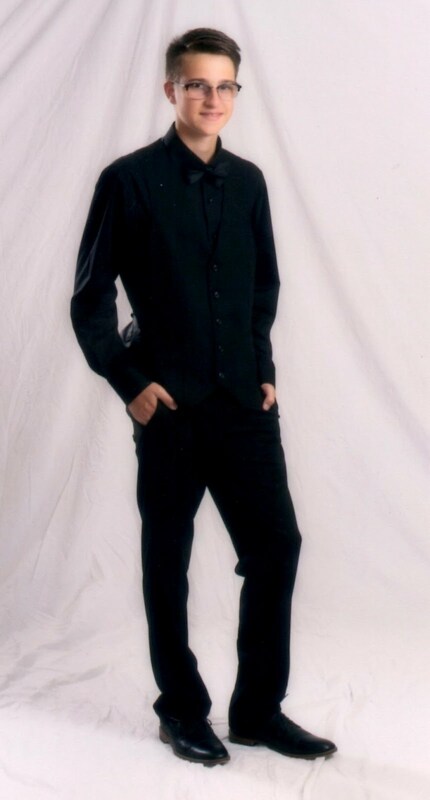 You can click on either picture to enlarge it. And the best part of all is it folds sideways to mail! There is an excellent tutorial on Split Coast Stampers. Edwin and Tilda are all bundled up and ready for some snow fun with Rufus. 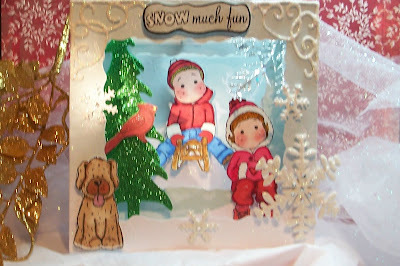 The trees, corners and snowflakes are die cut with a sizzix die out of glittered foam. You have two weeks to enter the challenge for a chance to win an adorable stamp of Tilda with a package, from Kellie's Magnolia Down Under Online Store. Sue this is brilliant. 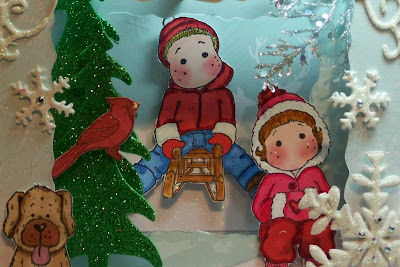 Love the use of all the stamps on the card and it is such a great idea with the overall card. Oh oh oh, mine mine mine mine!! I love this, it looks so deep and dimensional, those images are just darling and all of that glimmer and shimmer, WOW!!! Love this!! OH MY GOODNESS!!! Sue this is gorgeous!! Do u need my address hahahha. What a gorgeous Winter scene!!! Love everything you've put in here - amazing job and sooo much fun to look at!!! Great card and the dog is the perfect touch! Oh wow, what a szene.........I love the winterwonderland......Tilda and Edwin will have really fun. This is beautiful! I love the dimension and all the dazzling! Really wonderful! So beautiful Sue,i love your images and colours. Sue this is amazing! You always manage to take the challenge and just WOW us all! Your work is always so inspiring to not only the people playing along with us but to us as the DT as well. I just absolutely LOVE it! Thank you for such a stunning inspiration to all playing along. OMG, Sue, this is totally awesome. You've outdone yourself. Love your winter wonderland scene--you've set it up beautifully. I think I'd like to do something similar. Thanks for the inspiration. Beautiful card, love the different layers gives it so much dimension. Lovely colours and embellishments. Thanks for joining us.